ProMini 2.4GHz Tiny Wireless Keyboard (Built-in TouchPad/Laser Pointer) – Black – Desktopize – Give you web applications desktop power! 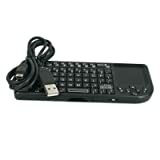 This keyboard is a great accessory for your laptop/home pc, ps3 or wii gaming systems. Its small compact frame allows you to carry it anywhere and maintain full control of your system. Like having a full size keyboard and mouse in the palm of your hand. 2.2.4G wireless receiver integrated design. 5.Windows Multimedia Control, Perfect control PC entertainment features. Teaching, training, lectures: keyboard, mouse, laser pointer in one hand and hand, three-dimensional explanation, amore lively! IPTV, Living Room Computers: lying on the sofa, the free manipulation of the living room computer, Internet, shopping, trade stocks and soon! Personalization: lying on a sofa or blanket to play computer games and the Internet is not cool? “Spiritual bond” is the personality of your choice! CARPC: car computer’s wireless best solution! Gifts: Business gifts, interpersonal gifts the bestchoice!